Founded in 1894, Portstewart Golf Club was always a haven for the golfing purist. However, the reputation of the Strand Course was further enhanced by the building of new holes in the dunes between the Atlantic Ocean and the River Bann in the late eighties. 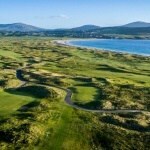 Now the Portstewart – Strand course is a must for those embarking on golf travel in Ireland. 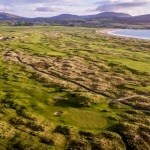 Huge dunes are complemented by stunning views across the bay to the blue Donegal hills. Every shot in the bag will be tested. 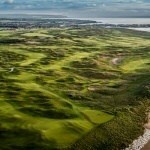 The strand course really is a true links course with fast greens in excellent condition all the year round. Portstewart played host as a qualifying venue in the 1951 British Open and has held all the major amateur national Championships. Of course, more recently, Portstewart Golf Club hosted the 2017 DDF Irish Open. The whole event was a huge success with Jon Rahm eventually winning the tournament in emphatic fashion. It really showcased to the world how spectacular Portstewart Golf Club is, as well as Northern Ireland as a golfing destination. Portstewart is also renowned for having one of the best front nine in golf. With spectacular views and towering dunes at every turn. Come and see it for yourself – with some beautiful 5 Star Castle Hotels along with other fantastic hotels and guesthouses in the north of Ireland, the Causeway Coast is a fantastic golf destination. With its neighbouring course Royal Portrush Golf Club as well as Castlerock Golf Club near by, Portstewart is located in a must play hub for any golf vacation. If you would like to play Portstewart Golf Club as part of your customized Ireland Golf Trip, please contact us on Ph: +353 (0)91 868642 or Email: sales@northandwestcoastlinks.com . Check out some of our sample packages here.